Following the tradition of wine-country villas in Italy and France, Villa Viamonte is open to guests interested in enjoying a memorable experience in the magnificent wine region of Mendoza, Argentina, where Malbec is the iconic grape and wine. Villa Viamonte is a rare old Spanish-style estate and one of the region’s great traditional homes, with 2 double en suite bedrooms, an office/reading room, open-style sitting and dining area, breakfast nook, a laundry room and a large fully-equipped kitchen and pantry in over 6,000 square feet of well maintained living space. The house sits on nearly 2 walled acres of lawn and gardens that include a huge swimming pool and a large entertainment house (Quincho) suitable for cooking classes, wine tastings or meetings. Two double bedrooms, each with private bathroom provide additional modest accommodation. Villa Viamonte is an ideal home-away-from-home for families or groups who are considering a visit to Argentina’s renowned wine region. Canadian winemakers Ann Sperling and Peter Gamble commenced a hunt for an elegant residence in Mendoza wine country in 2005, while simultaneously searching for an ancient Malbec vineyard of the finest quality. Villa Viamonte was purchased with a small group of friends from the Canadian wine industry. In 2008, after having viewed over 200 properties, an exceptionally high quality 1920 planting of Malbec was purchased located on legendary Cobos Road. 2009 marks the first vintage of exceptional winemaking under the Versado label. “We fell in love with this place - - the mountains, the people, the wine and the villa -- and we invite you to visit.” Villa Viamonte is now open for guests interested in enjoying a unique experience in the magnificent wine regions of Mendoza. 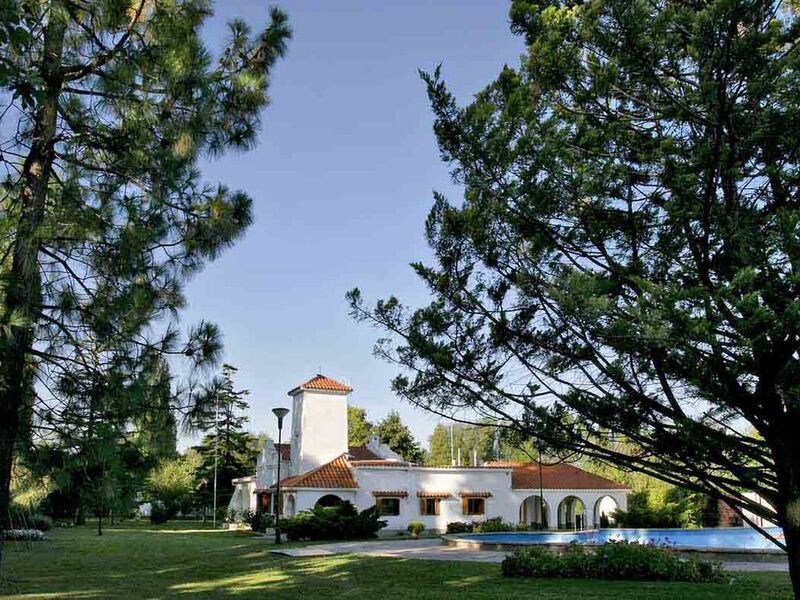 Villa Viamonte was a fabulous location for our extended family/friends vacation in Argentina. It is spacious and nicely appointed, with an extensive property surrounding the villa. It is in walking distance to many amenities and 1/2 block from the bus stop to take advantage of Mendoza province's excellent public transit system. We would love to visit again. Great example of how life in Mendoza once was with this grand finca. Honestly felt like we were staying in a living museum. Very spacious property that accommodated our large group spanning 5y.o. to 75y.o. Perfect for those that want a more relaxed setting, yet still close to the city provided you have transportation. Ann was very responsive and her on site staff was a available when needed. I would recommend this property without hesitation. We had a great stay at the Villa Viamonte. The property was well maintained and the caretakers were excellent. I’d recommend this property to anyone seeking a relaxing enjoyable stay in the Mendoza area. We enjoyed having you stay with us. We love our Mendoza wine country villa and pay particular attention to keeping it well cared for, so guests can relax and enjoy their stay. The place is great as well as the house caretakers. Excellent sourrandings too. We really enjoyed our stay. Its a large property with an outdoor swimming pool and we take pride in keeping everything in good condition so guests can relax and enjoy the place. From the moment the gate opened up we realized that we were going to experience a incredible and peaceful location. The location is perfect location for visiting the various Bodegas, Andres, Thermal Spa, and Mendoza City Center. Out the front gate and a block to the left are stores that can provide for your immediate needs for an Asado utilizing the properties cooking areas--excellent! Ann was fantastic with communications and recommendations--Thank you so much for making this a special event for our family. The accommodations are excellent...plenty of space, great kitchen, fantastic cooking areas, very well supplied, super clean, and most of all--peaceful. You won't be disappointed in your stay--actually your only disappointment will be not staying here! Thanks again for an incredible accommodation--the highlight of our time in the area! We take great pride in our traditional property Its a wonderful and convenient location in a great neighbourhood. First off, I'd have to say the communication with Ann was excellent. She was very responsive in getting back to us with any answers to our questions. The house was even nicer than the pictures led us to believe. The property is huge and very well kept. The neighborhood is wonderful and there is so much to do in the area. We absolutely loved this place and will be returning if it is still available the next time we come back to Mendoza. Thank you Ann! Villa Viamonte is located in the chique neighbourhood of Chacras de Coria. Known for its excellent restaurants and surrounded by fine vineyards, “Chacras” is just 20 minutes south of Mendoza’s modern city centre. Rates are shown in your local currency, however payment is converted to Canadian dollars.